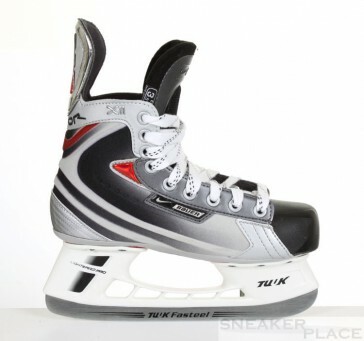 The Bauer brand is a leading manufacturer of hockey skates and equipment. The range goes from beginner skates model to professional ice hockey. The Bauer Vapor XII skate is a Semi Professional Hockey for youth. Ideal for beginning hockey players and skaters leisure. The very stiff and solid ice has an impact resistant Kunsstoffkappe, reinforced padded interior side of the ankle and a fully soft tongue. Is bound by the skate laces that run into increasingly hemmed eyelets. The blade holder tuk Lightspeed Pro with the runner Fasteel is qualitatively very professional.